HMH Books for Young Readers, 9780544610606, 200pp. Much like Lin-Manuel Miranda did in Hamilton, the New York Times best-selling author David Elliott turns a classic on its head in form and approach, updating the timeless story of Theseus and the Minotaur. 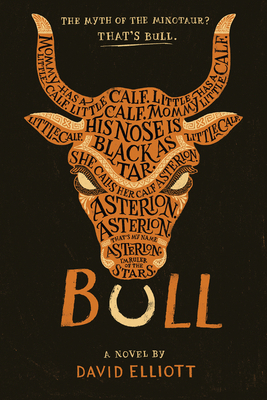 A rough, rowdy, and darkly comedic young adult retelling in verse, which NPR called “beautifully clever,” Bull will have readers reevaluating one of mythology's most infamous monsters. David Elliott is a NY Times bestselling children's author. His many titles include: And Here's to You!, The Transmogrification of Roscoe Wizzle, The Evangeline Mudd books, Finn Throws a Fit!, Jeremy Cabbage and the Living Museum, and In the Wild. His most recent titles include On the Wing, This Orq. books, and Nobody's Perfect. Born in Ohio, David has worked as a singer, a cucumber washer, and a popsicle stick maker. Currently, he lives in New Hampshire with his wife and a three-footed dog. If you'd like to know more about David and his books, visit him at davidelliottbooks.com or follow him on Twitter @DavidElliott10. ★ "This striking reexamination of the Greek myth Theseus and the Minotaur [is] a conceit that easily could have floundered; in Elliott’s capable hands, it soars."